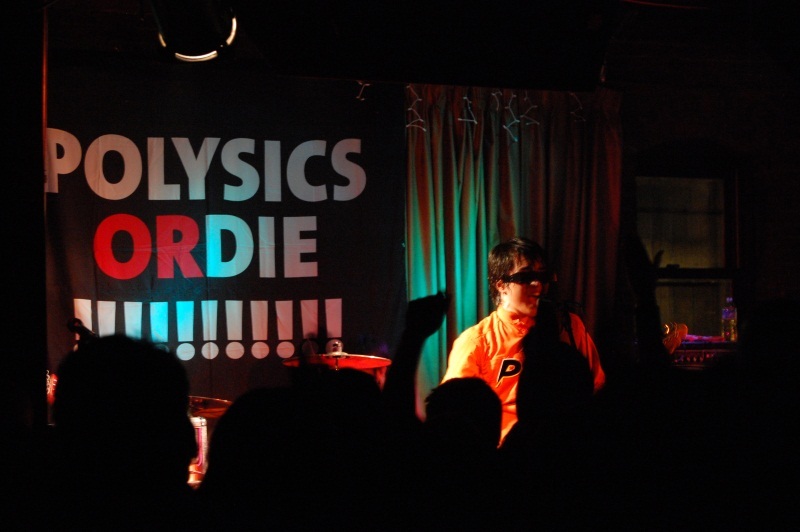 Culture was shocked in Akron last night thanks to Tokyo, Japan’s Polysics making a special appearance at Musica. The orange jumpsuit wearing foursome traveled half way around the world to perform their Devo inspired music to a packed club on what normally would have been just another regular Friday evening. Scenesters as well as a couple punk rockers and plenty of proud geeks piled into the quaint club in downtown Akron with perfect knowledge of what would soon progress. Polysics is best defined as a pop power punk electronica experimental new wave outfit or “technicolor pogo punk” as they dub themselves. Think heavy synthesizers and guitar matched over insane voice altering vocals as well as a very energetic male lead vocalist Hiroyuki Hayashi (Hiro – and yes, he sounds like Hiro from the TV show Heros) who blasts out English, Japanese, and gibberish lyrics. Formed in 1997 out of the pure love for Devo as well as The Tubes the band is an underground sensation thanks to their extremely energetic live shows and of course their orange jumpsuits and straight bar-style sunglasses. Opening the evening was a band called Stiletto hailing from Kent, OH. The band reminded me of Bedlight For Blue Eyes and Roses Are Red with their slight heavy rock sound. The lead singer had a good voice and when the band had it together they sounded fine. They sadly kept having issues starting their songs and it became apparent that they needed some more practice as it became downright annoying to some of the crowd. Still, they did well and get props from me when the lead signer quoted Tupac but really did not match up to the headliner at all. That really was something I did not want to see. I respected the artist though and did not shoot anything until the very end of the show because who am I kidding…I need at least one shot. Good thing I did not take photos as there was a dual braided memory card deleting bandit who was part of the Polysics crew. I understand the premise of his doings but you should have seen this guy. He stood upon a stool and the moment a flash went off he was bolting over to that non-sign reading schmo and erasing any Polysics related photo from their camera. Seeing what this guy was all about I really did not want him touching my gear so I parked the camera to my side and just enjoyed the show. Hands were about the entire evening. It was a party. You know a crowd is excited to see a band when they cheer insanely as the band is setting up their gear on stage. Things just got better when the band actually took the stage and just started hammering out songs. The songs they played ranged from almost industrial heavy pieces to absolute insanity jump-all-over-the-place songs. As entertaining as Hiro was throughout the night (especially when he screamed “you gruys awre awresoooooome!! !”) I absolutely adored the straight faced Kayo on the synthesizer and vocoder. I could not help but envision the scene in Revenge Of The Nerds II when the nerds played the concert at Hotel Coral Essex. According the band’s MySpace page Kayo will be parting ways with the band after the tour so I am pretty psyched I was able to the original line-up. The whole night was a party with Polysics controlling it. Fans danced and tossed their hands about to the music. It was indeed a interesting and fun evening. If I had to describe the evening I would have to say just imagine Daft Punk, Devo, and the Teen Titans humanized and in orange jumpsuits and you might have some idea what happened. It was amazing. Polysics – Young OH! OH! 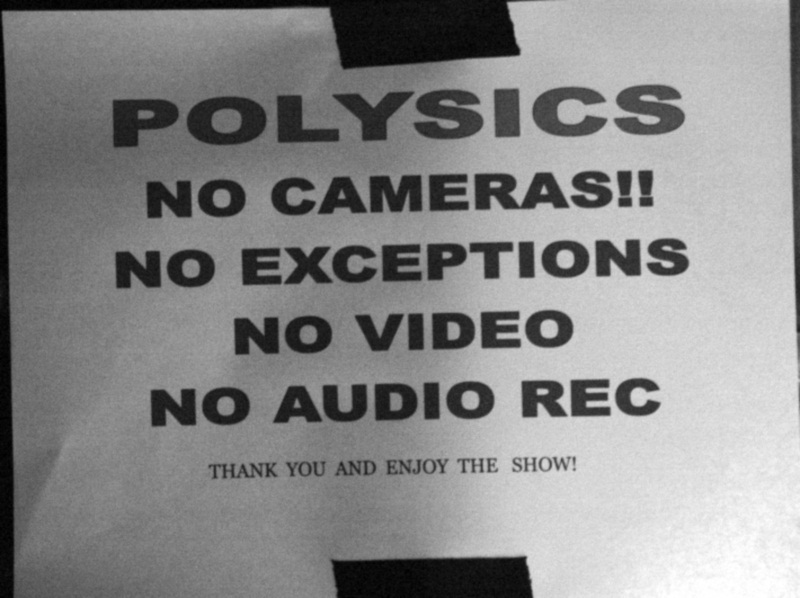 I am sitting here trying to think of something clever to say about the experimental pop act Polysics but my mind is blank. It would be all too easy to say they are the modern day Japanese version of Devo…just look at their outfits. Truth is they are Devo but mixed with some Daft Punk and even some of the more experimental Kraftwerk. The Japanese new wave, electronic, punk rock act has actually been around since 1997 and started “in the spirit of Devo” according to Hyroyuki Hayashi, the band’s vocalist / guitarist. They even wear Devo-like jump suits with the letter “P” on them. The foursome recently released their tenth album entitled Absolute Polysics on MySpace Records (US Release). I have only heard a sample of songs but I can tell you that they are a ton of fun and an absolute riot to listen to even if I can not understand all of their lyrics. For you people who like your music weird and of the wall, this is the band for you. To support my statement, both Wayne Coyne of The Flaming Lips and Mark Mothersbaugh of Devo have raved about Absolute Polysics. That right there proves there is something special about this band. Next month (Feb 12th) Polysics are making a stop at Musica in Akron, OH and I think it is safe to say that it will be a show not to miss. I myself plan on being there and you should too! DEVO Announce New Studio Album To Debut Fall 2009!!! I just received word that Akron, OH’s DEVO has announced that they will be working on a studio album for a Fall 2009 release! What the iconic new wave, art punk pioneers cautioned us about almost 30 years ago is no longer a humorous theory. It’s pretty much fact–we now live in a devolved world that’s getting wackier each and every day. The fall of 2009 will bring a new DEVO studio album, their first one since 1990’s Smooth Noodle Maps. It’ll mark their first new music since the strong fan reaction that greeted the 2007 single “Watch Us Work It,” their first new song in 18 years and one that was produced by Sweden’s TeddyBears (Robyn). They’re now in the studio putting the finishing touches on their new album (title TBA). The five-piece–featuring co-founders and songwriters MARK MOTHERSBAUGH (lead vocals, synthesizer innovations) and GERALD CASALE (lead vocal, bass) and rounded out by BOB CASALE (guitarist), BOB MOTHERSBAUGH (guitars/vocals) and JOSH FREESE (drums)–are set make a special U.S. appearance at SXSW this year including a press conference (4:00pm) and keynote panel (5:00pm)–moderated by radio veteran Nic Harcourt–set for Thursday, March 19 at the Austin Convention Center (500 East Cesar Chavez St.). They’ll follow that up with a Friday, March 20 one-night-only SXSW concert at the Austin Music Hall (208 Nueces St.). Pre SXSW, DEVO fans in Dallas can catch a special one-off show on Wednesday, March 18 at the Palladium Ballroom. In May, DEVO will head to the United Kingdom for a series of dates. On Wednesday, May 6, DEVO will perform their debut album, the seminal Q: Are We Not Men, We Are Devo! in its entirety from beginning to end at London’s Kentish Town Forum. Released in 1978, the seminal album produced by Brian Eno and recorded in Germany features such notable tracks such as the band’s cover of The Rolling Stones’ “(I Can’t Get No) Satisfaction,” “Mongoloid” and “Jocko Homo.” Next up on Friday, May 8, they’ll headline the All Tomorrow’s Parties festival in Somerset at the Butlins Holiday Centre. Formed in 1972 in Akron, OH, DEVO–short for “de-evolution”–began as an art project cautioning that humans were devolving and regressing into a herd mentality of American society, not evolving. A conceptual band from the beginning, DEVO were ahead of their time, incorporating elaborate aesthetics into their live shows and seamlessly combining their music with visuals years before MTV or any music-video culture existed. Indeed, the group’s first appearance at Kent State University in 1973 was recorded with a black and white portable video system. Societal satirists, DEVO’s lyrical mix of comedy and quirky wit, warned of the dangers of rampant capitalism in “Whip It” and “Freedom of Choice”, and the devolution of society in “Jocko Homo” and ”Beautiful World.“ Onstage in their early incarnation, the group began with a mixture of synthesizers and rock instruments; as they developed in the late seventies and early eighties, DEVO became one of the first American acts to perform using only synthesizers. DEVO have now returned with an evolved look, ready to impact the vastly devolved world we now find ourselves trying to navigate.